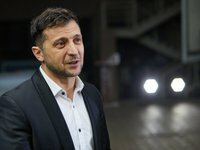 Showman and presidential candidate Volodymyr Zelensky has said that provocations and several criminal cases against him are being planned in the self-proclaimed Luhansk People's Republic (LPR). "The authorities are desperate. First, they started bugging my office. Secondly, they registered a criminal case against me, against Kvartal 95, for some kind of money laundering. Thirdly, there was information that special people are looking for contacts in LPR to find out where my political billboards are displayed there, billboards with my face. I am very glad that our government has many friends among terrorists. Fourth, a deputy from one party of three letters ... registered a criminal case against me personally," Zelensky said in a video message on Facebook on Thursday. Zelensky said in the near future a criminal case would be opened against him for "allegedly running over a man in a car in Chernihiv region during 2002." Zelensky in the clip thanked his supporters. To those who spread fakes he said, "We all remember, we will never forget. We will respond lawfully."